Register 2 new partners via purchase of the Welcome Pack and you’ll receive 1 complimentary bottle of Alveo (flavor of choice). Register 3 new partners via purchase of the Welcome Pack and you’ll receive 2 complimentary bottles of Alveo (flavor of choice). Register 4 new partners via purchase of the Welcome Pack and you’ll receive 4 complimentary bottles of Alveo (flavor of choice). Register 1 new partner via purchase of the Gold Pack and you’ll receive 4 complimentary bottles of Alveo (flavor of choice). A shipping charge of $13.00 will be applied to all of the above. Please note that you will not receive any points for any complimentary bottles of Alveo. Offer valid through May 1, 2011 to June 30, 2011 or while supplies last. Akuna reserves the right to modify, suspend, or discontinue this promotion at any time. Additional terms and conditions may apply. Spring and summer bring a lot of energy and optimism. However, for some people, it is the time they dread the most. Why? Because they suffer from allergies that can make each day an ordeal. Seasonal allergic rhinitis (commonly called hay fever) is an allergic reaction that can affect nose, roof of the mouth, back of the throat and conjunctiva (whites of the eyes). The name “hay fever” is misleading because hay is rarely the trigger and a fever is never present. In the early 1800s, British doctors noticed that some rural residents started sneezing, coughing and got itchy eyes after being exposed to cut hay or grass. Today we know that seasonal pollens and molds can set off these symptoms. They called the condition a “fever” because it caused nervousness, one of the old English definitions of fever. Perennial allergic rhinitis is a reaction that involves mostly the nasal tissue and it can occur at anytime throughout the year. Normally, our immune system fights off foreign substances (commonly called antigens). The immune system of some people is hypersensitive and can overreact to certain antigens that are harmless to most people. This over-reaction triggers an allergic reaction. The first exposure to the antigen (in an allergic reaction it is called allergen) usually does not cause any symptoms but the person gets sensitized, so that every subsequent encounter with the allergen triggers a release of the body’s own chemical substances (such as histamine) that initiate and inflammatory response in a particular part of the body. Allergies have become increasingly common in the development countries and as research suggests, this is paradoxically due to the wide use of mainly antibiotics and household disinfectants. Development of a healthy immune system requires some exposure to bacteria, viruses and parasites and since we get less and less exposed to them, our immune system may instead react to harmless substances such as pollen and mold and thus activate an allergic reaction. In seasonal rhinitis, allergens causing inflammation of the nose, throat and eyes are outdoor pollens (from tree, grass, ragweed), spores and molds that are carried on the wind during certain times of the year, hence seasonal rhinitis. People may react to one or more allergens. Indoor allergens, such as animal dander, dust mites, and molds/spores (found in carpeting, wallpaper, house plants) trigger allergic reaction all year around, hence perennial rhinitis. In recent months Akuna has been working long and hard to make significant improvements that would drive your business, allow you to further develop and grow your organization, and of course, maximize your profits. 1. Prices of all products have been reduced by 25% (of retail cost)! A case of Alveo has been reduced from $240.00 to $180.00. A case of Onyx Plus has been reduced from $160.00 to $120.00. A set of Take a Plaster has been reduced from $88.00 to $75.00. 5. New bonuses and exciting incentives for all distributors! 6. Simplified ways to become a Leader faster! 7. New bonus price is now $0.4125 per point. Akuna hopes that these changes will serve as tools to help you effectively expand your independent Akuna business. You may download New Compensation Plan 2011. And what about chicken soup, you ask? The suspected benefits of chicken soup have been reported for centuries. The Egyptian physician Maimonides recommended it for respiratory symptoms in his 12th century writings that were, in turn, based on earlier Greek writings. And, of course, mothers all over the world have said it time and time again. University of Nebraska researcher, Dr. Stephen Rennard, became interested in the subject, and in 1993, he conducted a well-controlled research study on chicken soup that he prepared in the laboratory following his family’s recipe. He was not able to identify the exact ingredients or ingredients in the soup that he prepared in the laboratory following his family’s recipe. He was not able to identify the exact ingredient or ingredients in the soup that made it effective but concluded that it was the combination of all the vegetables and the chicken soup that made it so beneficial. The study also presented evidence that chicken soup can stop or reduce inflammation. Since inflammation, particularly of the respiratory tract, contributes to cold/flu symptoms, the soup clearly has its benefits. For comparison purposes, commercially available chicken soups were tested for anti-inflammatory effects, and most of the soups were just as effective as the homemade chicken soup. There are also many herbs, which are recommended for both conditions. Some boost the immune system, some suppress cough, and yet other reduce fever. Since all herbs contain active substances that may interact with other herbs, supplements or medications, or trigger side effects, it is advisable to consult a knowledgeable practitioner in this field. Here some of the herbs used to treat cold/flu that are also found in Alveo: Licorice, Peppermint, and Yarrow. Similarly, dietary supplements (such as vitamins, minerals and others) may interact with medications or have various side effects; therefore, a consultation with a knowledgeable health provider is advised. Despite a popular belief that vitamin C can cure a cold/flu, the scientific evidence in support of this, is limited. Some experts suggest that vitamin C may only be beneficial for individuals with already low levels of this supplement. Others suggest that the effect of vitamin C may be very individual – some people may improve, while others may not. Several studies, but not all, have revealed that zinc lozenges and nasal zinc gels may reduce some symptoms of cold and flu, cough in particular. However, nasal zinc spray does not appear to have the same benefits. Even though everybody gets cold/flu from time to time, there are preventive measures one can take. The best defense is frequent hand washing. Scrubbing your hands for at least 15 seconds with the ordinary soap and water is the most efficient way to prevent viruses from entering the body. Remember: telephones, doorknobs, shopping cart handles and computer keyboards, are well known carriers of germs! And of course, a healthy diet, regular exercise, adequate rest and reduction of stress are all essential I building a strong immune system. One of the reasons our body needs food supplements is the quality of food in our stores and markets. Most of our food, if not all, is mass-produced, meaning it is produced with the use of pesticides, colorants and additives. It often has decreased nutritional value. Since food is essential in keeping our organs and body systems working properly, we need to add supplements to our diets to meet nutritional requirements and to keep our bodies strong and resilient. In order to get all nutrients to our organs, our digestive system must absorb them well. Alveo is an excellent digestive tonic and as such, helps in the gastrointestinal absorption by stimulating digestive enzyme production. The herbs found in Alveo also have anti-inflammatory properties in the gastrointestinal tract. When our organs are well-nourished and function properly, we are much more prepared to face the fall and winter seasons. Fall and winter are upon us once again, and with them the most common illnesses of the season: the cold and the flu. People often use the terms cold and flu interchangeably; however, these are two separate conditions. The common cold is an upper respiratory infection caused by a virus. It is usually not accompanied by a fever but it does affect the nose, sinuses, throat, larynx, and often also the trachea and bronchi. Influenza, or flu (grippe, grip), is also a viral infection affecting the respiratory tract but in addition is accompanied by fever, general malaise, headache, muscle pain, stomach pain and such. In severe cases, it may even result in death. There are over 200 different types of viruses which can cause a cold. Most commonly, you can get a cold by touching your nose, eyes or mouth after handling a contaminated object. However, cold-causing viruses can also be transmitted through the air. Exposure to chilly outdoor air will not make you more susceptible to get a cold as is often believed, on the other hand, emotional distress and excessive fatigue actually may. On average, an adult may experience between 3-6 colds in a year, while a child may have as many as 8-10. Many different types of influenza viruses belonging to either Influenza A or B groups may cause the flu. The flu is very contagious and spreads easily from person-to-person (e.g. through handshakes or the sharing of utensils) or via air droplets (containing a virus) that contaminate objects. Flu epidemics often occur about every x number of years and usually affect the entire country; occasionally (about once per decade), the flu spreads across all continents. Conventional medicines, herbs, supplements and other forms of treatment can only help in alleviating the symptoms of both, the cold and the flu, but cannot treat or cure either condition. Saline nasal sprays – will help you combat stuffiness and congestion. Unlike decongestants, saline sprays don’t lead to a rebound effect – a worsening of symptoms when the medication is discontinued. They are safe and nonirritating, even for children. Do you often feel under the weather, sluggish and mentally drained? Your body may be overloaded with harmful toxins and you may not even know it! In order to help our bodies naturally return to a healthy, balanced state there are several actions we can take. In this Detox Guide Dr Jari Bertlik discuss these options and show you how with the help of two excellent Akuna products, you can jumpstart your way a healthier and happier you. Alveo should be a basic part of our preventive health program against majority of diseases and premature aging. Alveo improves the function of Central Nervous System (CNS) by supporting blood circulation and the nutritional requirements of the brain. It also improves the activity of neurontransmitters (chemicals which help to transmit nerve impulses), and has a calming effect. The extracts that have the greatest effect in this area are ginkgo biloba, gotu kola, lavender, passionflower and blessed thistle. The result is an improved memory, better concentration, an improved ability to adapt one’s mood (and in avoiding depressive moods), and deeper sleep. CNS functions are important to support because the brain creates hormones that affect every other organ in the body. A healthy brain usually means a healthy body. Alveo harmonizes the hormonal system by providing prohormones of phytosterol, plant hormones that activate your natural metabolism by working on the endocrine glands. The main extracts utilized in this area are red clover, licorice, and alfalfa, as well as several others. They are important to menstrual regularity, fertility in both genders and for moderating the symptoms of menopause. These extracts also help to regulate blood sugar levels, helping to prevent diabetes and obesity. Alveo also harmonizes the function of the immune system by adapting the capacity and mucous membranes of the alimentary tract, harmonizing the microbes in the large intestine and by boosting the Peyers patches; the cells of the immune system that surround the small intestine. It helps food move through the intestines and has anti-inflammatory effects on the intestinal wall. Baradykinase from aloe, tannins, pectins, chlorophyll and antibiotic substances are those parts of Alveo that are active here. Alveo helps the hormonal system create estrogen – an essential hormone even for men. It also increases our resistance to stress by boosting the immune system and has detoxicative and diuretic effects that facilitate the function of the liver and kidneys. Extracts from gingko biloba, licorice and alfalfa lead the way in fighting off autoimmune diseases (diseases where the body has an immune response to itself) such as psoriasis. Extracts from Siberian ginseng, gingko biloba, red clover, licorice, horsetail, Chinese fo-ti-tieng, alfalfa and Korean ginseng also have a positive influence on the prevention of oncogenous diseases. Alveo ensures the efficiency of vitamins in fighting increased levels of homocystein because by working on hormones it regulates the enzymes and the substances from which an organism creates these enzymes. Alveo therefore operates at the earliest stages of the defect development, compared to most of today’s pharmaceutical products; which try to fix problem once it has already become major. 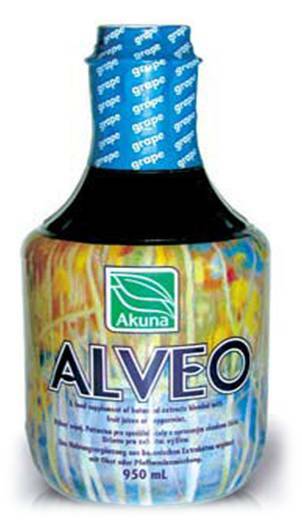 Alveo positively influences the activity of the digestive tract by improving the appetite and optimizing the amount and composition of the digestive system and biliary juices (in particular, decreasing the growth of the Helicobacter pylori using Irish moss extract, and thereby preventing ulcerative disorders of the stomach and the small intestine). It also supports the activity and enzymatic set of the liver (this is where the organ sulphides and bitter extracts from the blessed thistle and yellow genitian come in), and by assisting the adaptation of enteric micro-flora, which provide anti-bacterial, anti-virus and anti-fungal effects, especially in the large intestine and the regulation of bowel movement (through extracts from aloe, licorice, red clover and thyme). Alveo harmonizes blood circulation by improving heart activity (by utilizing Siberian ginseng, Korean ginseng, alfalfa, lavender, gotu kola and passionflower), improving blood clotting ability, expanding the blood vessels from the coronares to the capillaries (gingko biloba, cayenne and cinnamon operate here) and accelerating blood circulation. In addition, Alveo supports blood cell creation because the immune system becomes more harmonized with the cytokine set-the cells which destroy alien proteins in the blood. Alveo stimulates and protects the respiratory system: it positively influences the depth and frequency of the breath (using yarrow and cayenne); and commensurate with your present condition it may moisten the airways and release mucus, Alveo aids the airways in their expansion and contraction, stimulating expulsion (blessed thistle, horsetail, fennel seed, licorice, Irish moss) and at the same time calming a dry cough (boneset and thyme). By virtue of its anti-inflammatory, anti-bacterial and anti-viral effects. Alveo leads to the prevention of diseases of the respiratory system. Alveo harmonizes the musculoskeletal system: it releases tension in the muscles (ginseng, passionflower and guarana) and strengthens muscles that are flaccid and weakened. By regulating muscle tension, it helps to protect ligaments and bones from stress due to contracted muscles (using Chinese fo-ti-tieng, cardamom and gotu kola). It also improves the quality of articular cartilage – the anti-inflammatory effects from the extracts can assist in the prevention of rheumatism and arthritis, which are often a result from inflamed joint cartilage.